Jaded Ibis Press, founded in 2010, is one of the most innovative small presses around. This is at least in part due to its business model, which while still producing traditional books is overtly grounded in network theory. According to the press’s website, “Our innovative business model arose from an understanding of Systems Theory and a confidence in its organizational efficacy. 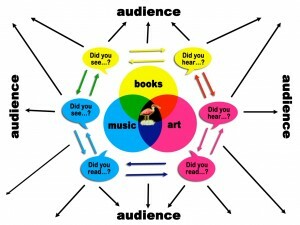 . . By linking literary, visual, and musical arts — and the newest technological platforms — we can expand audiences for all participants.” The press produces works of collaboration between writers, visual artists, and musicians, with enhanced content in multiple formats, including full color artist books and music CDs. On Friday, September 19, at 7 p.m., Counterpath hosted a reading and performance by Jaded Ibis authors Jorge Armenteros, Tom Bradley, Carol Ciavonne, Matthew Cooperman, and Marius Lehane. Jorge Armenteros is author of The Book of I (Jaded Ibis, November 2014). He is a practicing psychiatrist and graduate from Harvard University. In addition to his medical training, he completed an MA in Spanish and Latin American Literature from New York University, and MFA in Creative Writing from Lesley University. Born in Cuba, Armenteros now divides his time between Florida, Georgia, and the south of France. Carol Ciavonne is author of Azimuth: poems (Jaded Ibis, September 2014). Her poetry is both lyrical and experimental and has been noted for its visual imagery. Poems have appeared in Denver Quarterly, Boston Review, Colorado Review, New American Writing and How2, among other journals. She was the recipient of the PSA Lyric Poetry Prize in 2004. Her essays and reviews have appeared in Poetry Flash, Xantippe, and Pleiades. She was selected as a workshop participant at the New York Center for Book Arts in 2007, and was a writer in residence at the Pécs Writers Program in Pécs, Hungary, in 2013. She recently published, along with artist Susana Amundaraín, an art/poetry dialogue (Birdhouse Dialogues, LaFi 2013). Ciavonne has also collaborated with Amundaraín on several theater pieces, and has worked with the innovative Imaginists theater collective. Ciavonne has a B.A. in Art, and an M.A. in Poetics from New College of California. She lives in Santa Rosa, California. Tom Bradley is the author of Family Romance (Jaded Ibis, Fall 2012). He taught British and American literature to Chinese graduate students in the years leading up to the Tiananmen Square massacre. He was politely invited to leave China after burning a batch of student essays about the democracy movement rather than surrendering them to “the leaders.” He wound up teaching conversational skills to freshman dentistry majors in the Japanese “imperial university.” Tom is a former lounge harpist. During his pre-exilic period, he played his own transcriptions of Bach and Debussy in a Salt Lake City synagogue that had been transformed into a pricey watering hole by a nephew of the Shah of Iran. Family Romance is Tom’s twentieth published book. Matthew Cooperman is the author of Imago for the Fallen World (Jaded Ibis, Spring 2013). He is also the author of Still: of the Earth as the Ark which Does Not Move (Counterpath, 2011), DaZE (Salt Publishing Ltd, 2006) and A Sacrificial Zinc (Pleiades/LSU, 2001), winner of the Lena-Miles Wever Todd Prize, as well as three chapbooks, Still: (to be) Perpetual (dove | tail, 2007), Words About James (phylum press, 2005) and Surge ( Kent State University Press, 1999). A founding editor of Quarter After Eight , and current poetry editor of Colorado Review , he teaches at Colorado State University in Fort Collins, where he lives with the poet Aby Kaupang and his two children. Marius Lehene is a Romanian-born visual artist active in the United States and internationally. His recent exhibitions include shows at Boulder Museum of Contemporary Art; Casa Matei Gallery at the University of Art and Design in Cluj, Romania; Manifest – Creative Research Gallery and Drawing Center in Cincinnati, Ohio; Pollock Gallery in Dallas, Texas; and the Ice Cube Gallery in Denver, Colorado. In 2013 he received one of the Dave Bown Projects Competition awards. Lehene is also the winner of the 2010 McNeese National Works on Paper Exhibition and of the 2007 edition of Positive/Negative 22 National Juried Exhibition. His collaborative book with poet Matthew Cooperman, Imago for the Fallen World, was published by Jaded Ibis Press – Seattle, in 2013. He holds an MFA degree in Drawing and Painting from Southern Methodist University and a BA in Economics from Babe?-Bolyai University, Romania. Lehene lives in Fort Collins, Colorado, and teaches in the Department of Art at Colorado State University.